Mangaluru, Dec 12, 2015: : President of Karnataka Hindulida Vargagala Vedike K S Shivaram has challenged Sri Vishwesha Theertha Swamiji of Pejawar Mutt to hold a ’Sahapankti Bhojana’ along with Dalits, backward class people as well as civic workers during the next Paryaya. Speaking to reporters here, Shivaram said the Pejawar seer who visits Dalit colonies and holds Padayatra has to accept the challenge if he was truly concerned about the welfare of Dalits and backward classes. Expressing his strong resentment to the practice of Yede Snana wherein devotees have to roll over Prasadam offered to the Lord, it was equally regressive as Madesnana wherein devotees roll over leftovers on plantain leaves. The practice of Yede Snana should not be allowed, he said. Shivaram further said he too would participate in the Sahapankti Bhojana if Pejawar seer accepts his challenge. On the demand to construct Ram Mandir, Shivaram said what was needed at the moment was a Buddha Mandir to promote equality rather than a Ram Mandir. The Hindulida Vargagala Vedike has planned to hold a huge demonstration demanding implementation of the anti-superstition bill and to oppose blind beliefs. The demonstration would be held on January 15 next year, he added. 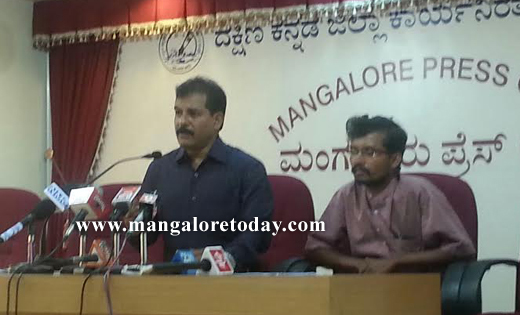 Shekhar Belthangady, President of Dalita Hakkugala Horata Samithi of Belthangady was also present at the press meet.